Why run a marathon in the name of Joe Strummer? 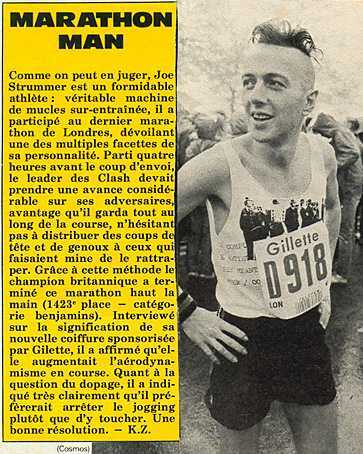 Because Joe Strummer ran several marathons at the peak of his fame: London in 1981 and 1983, and Paris in 1982. The Paris run was extra special as he had “disappeared” from friends, family, band and management – and had the last laugh when he showed up running alongside tens of thousands of people a few weeks later. I have yet to see rumors that he ran one of the London Marathons in 3hrs:20 to be confirmed. The Loch Ness Marathon looks like a blast (all things being relative), starting at the original Great Lake and ending in Inverness. If money were no object, I’d fly over and do it myself. Anyway, when Guscin, 41, first alerted me to his charity run, he announced his intent to run under 3 hours. I have subsequently talked him into what I trust will prove a more attainable goal: 3hrs 30. I’m still feeling the pain from meeting that time in Burlington, four days after the event, so I can assure Guscin he has his work cut out for him. If you care to sponsor his run, you could always offer him one sum for completing the race, and another if he meets that 3:30 goal; I’m sure he’ll agree the additional pain will be worth raising the extra funds. You can donate from here. Paul has also been very helpful linking my own posts about Mick Jones and Carbon/Silicon to the relevant web sites so I’m more than happy to link him here in turn. Please, people, I know times are hard, but just consider a fiver a piece to encourage this one man to run in the name of one great man. (And another fiver if he makes it in under 3hrs 30mins.) Cheers and good luck with the training, Paul. You may want to read How Much Will It Hurt: Ten Tips For the Marathon Virgin.